Below you fill find all funeral homes and cemeteries in or near Sauk Rapids. Sauk Rapids is also known as: Benton County / Sauk Rapids city. Zip codes in the city: 56379. Some of the notable people born here have been: Bridget Jones Nelson (actor and screenwriter). Sauk Rapids is a city in Benton County, Minnesota, United States. The population was 12,773 at the 2010 census and is 13,348 according to 2014 census estimates. It is located on a set of rapids on the Mississippi River near its confluence with the Sauk River.Sauk Rapids is part of the St. Cloud Metropolitan Statistical Area. It was noted by Kent Reporter on February 17th, 2017 that Margarent Jennings (Misho) passed on in Washington. Ms. Jennings was 95 years old and was born in Sauk Rapids, MN. Send flowers to share your condolences and honor Margarent's life. It was reported by The News Tribune on May 15th, 2016 that Norma E Manford passed away in Tacoma, Washington. Manford was 86 years old and was born in Sauk Rapids, MN. Send flowers to share your condolences and honor Norma E's life. It was disclosed by San Diego Union-Tribune on March 12th, 2016 that Ellen Alice Steffes (Lemmerman) died in San Diego, California. Send flowers to share your condolences and honor Ellen Alice's life. It was noted on October 1st, 2015 that Lillian May passed away in Sauk Rapids, Minnesota. May was 97 years old and was born in Powers Lake, ND. Send flowers to express your sorrow and honor Lillian's life. It was written by West Central Tribune on April 10th, 2015 that Beatrice I "Bea" Manthei (Butenhoff) died in Sauk Rapids, Minnesota. Ms. Manthei was 92 years old. Send flowers to express your sorrow and honor Beatrice I "Bea"'s life. It was written by West Central Tribune on April 2nd, 2015 that Virginia Lee "Ginny" Urman (Naylor) died in Sauk Rapids, Minnesota. Ms. Urman was 78 years old. Send flowers to express your sorrow and honor Virginia Lee "Ginny"'s life. It was disclosed on March 28th, 2015 that Dorothy Suzick (Deuel) passed away in Sauk Rapids, Minnesota. Ms. Suzick was 85 years old and was born in Grand Island, NE. Send flowers to express your sympathy and honor Dorothy's life. It was revealed on February 12th, 2015 that Patricia M Galloway died in Sauk Rapids, Minnesota. Send flowers to express your sorrow and honor Patricia M's life. It was reported by West Central Tribune on February 9th, 2015 that Raymond H W Brede died in Sauk Rapids, Minnesota. Brede was 92 years old. Send flowers to share your condolences and honor Raymond H W's life. It was written on January 24th, 2015 that George O Andreassen died in Sauk Rapids, Minnesota. Andreassen was 84 years old. Send flowers to express your sorrow and honor George O's life. Several buildings had to be demolished during the construction process, which meant that some parts of downtown were rebuilt. 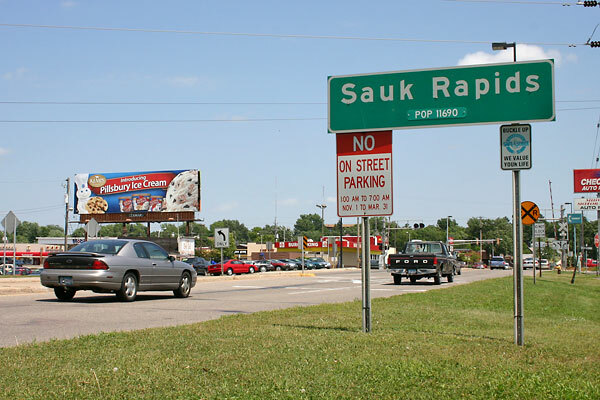 Soon other settlers followed and the town was named Sauk Rapids after the rapids just below the Sauk River's mouth on the Mississippi. Soon a general store was built, then a hotel, and a large jail. Cloud, Minnesota Cloud and Crow Wing. In addition, some sidewalks were repaved with cobblestone. The official website for the city of Sauk Rapids is http://www.ci.sauk-rapids.mn.us/. Listing all funeral homes in Sauk Rapids, Minnesota so you can easily send flowers to any location (same day delivery) or find any funeral service. We work with local florists and flower shops to offer same day delivery. You will find budget sympathy flowers in Sauk Rapids here. Our funeral flowers are cheap in price but not in value.